As we relax in the knowledge that Daniel Levy insists there is no chance of Tottenham selling both Hugo Lloris and Harry Kane to the leeches of Manchester United, come with me back into the past to meet a man who did so much to put Spurs on the football map as a major club. Each week during the summer lull I will be spotlighting the heroes who have laid the foundation to the club we have today, and I hope some of the historic facts trickle through to those voters who managed to elect an �Ultimate� Tottenham team without a single representative from the Push and Run or Double sides. Anybody who does not appreciate that these were without question the two finest teams produced by Tottenham have no sense or knowledge of the club�s great past. There is a generation growing up that seems to think football started with the 1992 launch of the Premier League. I know I am a boring old fart � or, as pious Piers Morgan recently called me on line, �an insufferable, pompous old fool.� I will wear that insult from a goon of a Gooner with pride. I think if anybody wants to call themselves a true Tottenham fan they should take the trouble to find out who were the outstanding managers and players that shaped and stirred the club. They do not come any more inspirational than Arthur Rowe, the coaching master who put Push and Run into the football vocabulary. 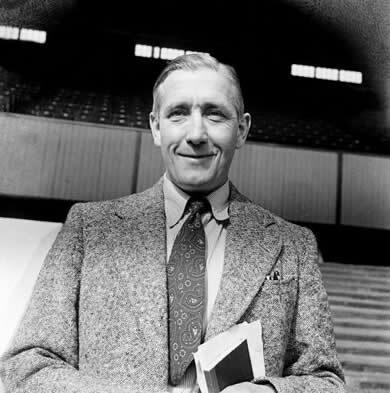 He took over the managerial reins at a rocky time in the club�s history after the red-blooded Joe Hulme had failed miserably as the club�s first post-war manager. Almost as if waving a magic wand, Rowe produced order where there had been chaos, method where there had been mayhem and triumph where there had been disaster. The transformation was close to miraculous. Arthur, born and raised within goal-kicking distance of White Hart Lane and as modest and likeable a man as you could wish to meet, was never one to want to take credit for his own genius. He would always stress that the real father of Push and Run was his old Tottenham mentor Peter McWilliam, a trend-setting tactician in two spells in charge at White Hart Lane and featured here last week on my Spurs Odyssey stage. McWilliam was building the 1921 Tottenham FA Cup winning team when Arthur joined Spurs as a schoolboy. The Scot helped launch Arthur�s playing career with the Tottenham nursery team Gravesend and Northfleet. He developed into a thinking man�s centre-half for Tottenham throughout the 'thirties until a knee injury forced his retirement after an international career confined to one England cap. Hungry for adventure and to spread the football gospel, Arthur travelled through Europe as a full-time coach and was on the verge of accepting the Hungarian team manager�s job when war was declared. There is a school of thought that it was his ideas passed on to young Hungarian players that was the foundation for the Magical Magyars of the 1950s, who buried England under an avalanche of 13 goals in two mesmeric matches. Adding strength to this theory is that he coached the coaches at the request of the Hungarian government. On his war-forced return to England from Hungary, Arthur became an army physical training instructor and then manager of non-League Chelmsford, making him ideally placed to take over at White Hart Lane as successor to Joe Hulme in 1949. His first major signing was Southampton right-back Alf Ramsey, a player he knew shared his keep-it-simple principles. Nicknamed �The General� because of his fanaticism for talking football tactics, Ramsey took the secrets of simple football with him into management, and there was more of a hint of the Arthur Rowe push and run style about the Ipswich side he steered to the League championship and the England team he led to the World Cup in 1966. 'King Arthur's' knights marched majestically to the Second Division title in Rowe�s first full season in charge, but sceptics said their �playground push and run� tactics would be exposed in the First Division. Wrong! They powered to the top of the table, eventually taking the 1950-51 League championship with 60 points, four ahead of Manchester United and the highest total since Arsenal�s record 66 twenty years earlier. It was their attack, led aggressively by Channel Islander Len Duquemin, that took the eye, but the defence was a vital part of the jigsaw. It featured the safe hands and acrobatics of goalkeeper Ted Ditchburn, the towering presence of centre-half Harry Clarke, the perfect balance of full-back partners Alf Ramsey and Arthur Willis, and two of the finest half-backs in the League in Bill Nicholson and skipper Ronnie Burgess. Eddie Baily�s inch-perfect passing from midfield was a key factor as Spurs took apart the best defences in the land, scoring seven goals against Newcastle, six against Stoke, five against West Brom and defending champions Portsmouth, and four in three of the first four matches of the season. Push and run became more like push and punish. It was wonderful to watch, provided you were not the team on the receiving end. I caught up with Arthur in my Fleet Street reporting days when he was �curator� of the short-lived PFA-supported Football Hall of Fame in west London in the early 1970s (a venture that quickly died because of lack of public interest). A gentle, kindly man, Arthur was easy to talk to, and we had many long conversations about his career in the game in general and his management of Spurs in particular. He revealed that the art of push and run football � the signature style of Spurs � was born against the walls of North London. Sadly, the stress and strain of managing Spurs took its toll on the enormously conscientious Rowe and he reluctantly had to stand down in 1955, with the team he had created, cajoled and championed showing the sign of advancing years. The lowest point was a 3-1 FA Cup defeat at York City. That was the nightmare result that finally broke Arthur�s spirit. He later coached West Brom, Orient and Millwall and steered Crystal Palace to promotion, but his health was very fragile and he was never able to touch the heights he � and all the Lilywhite fans � had enjoyed at The Lane. His last major signing for the club was a player who was to become a Lane legend, Danny Blanchflower, bought from Aston Villa for �30,000 and in Arthur�s expert estimation the perfect player to carry on the push and run philosophy. Push and run was poetry in motion, and it was Arthur�s lasting legacy. They should build a statue of him at The Lane alongside that of Bill Nicholson and in memory of the man who pumped the pride and the passion back into Tottenham. Next week: The man with the giant hands, Pat Jennings. Who played for Chelsea and Tottenham in the 1990s and won 43 international caps, and which club did he join from Spurs? Yes, it�s Gordon �Jukebox� Durie, who saved his best when he moved on to Glasgow Rangers from Tottenham. First name drawn from the correct answers is Andy Stratford, of Fairford, Gloucestershire. I will email a screen version of one of my Tottenham-themed books to Andy, who was born in the magical Double year of 1961 and claims to have been a Spurs fan from birth. Email your answers, please, to author@normangillerbooks.com. With Father�s Day galloping up, don�t forget you can purchase any of my books from me at www.normangillerbooks.com, including No 99 that I have written in tribute to Muhammad Ali for whom I worked as a publicist on his European fights. He needed a PR like Einstein needed a calculator. All profits from my Tottenham-themed books go to the Tottenham Tribute Trust to help any of our old heroes who have hit difficult times.